Did Jimmy Kimmel kill the health care bill? Jimmy Kimmel spent the week on TV battling a health care bill he didn't believe in. On Friday, the bill appeared to be on its last legs, and Kimmel may have played a part. Sen. John McCain announced Friday that he cannot "in good conscience" vote for the GOP's latest plan to overhaul Obamacare. This likely ends the Republicans' latest effort to repeal and replace the Affordable Care Act. Following McCain's statement, Kimmel took to Twitter to say, "Thank you @SenJohnMcCain for being a hero again and again and now AGAIN." The tweet capped off a dramatic week that included three nights of opening monologues in which Kimmel blasted one of the bill's sponsors, Louisiana Senator Bill Cassidy, for failing to make due on a promise to ensure that, as Kimmel said, "No family should be denied medical care, emergency or otherwise, because they can't afford it." This standard became known as the "Jimmy Kimmel Test." "Nobody should count this bill completely out, but if McCain's opposition does signal its demise, the human face put on the potential impact of the bill by Jimmy Kimmel's principled stand against it has to be acknowledged as a legitimate factor," said Bill Carter, a CNN analyst who has written two books about late-night TV. In this political climate, late night TV has become both a refuge and a political platform. From Stephen Colbert's searing satire of President Trump to John Oliver's deep dives into current events, hosts have mixed commentary with comedy. For Kimmel, his ABC broadcast gave him a platform to fight for something much more personal and close to his heart: His son, Billy. This battle began in May when the host got emotional as he revealed that his son was born with a serious heart issue. The personal and impassioned story morphed into a screed about health care policy. "If your baby is going to die and it doesn't have to, it shouldn't matter how much money you make," he said at the time. "I think that's something that whether you're a Republican or a Democrat or something else, we all agree on that, right?" The monologue went viral, prompting Cassidy to coin the "Kimmel Test," a term that reflected the Senator's standard for repealing and replacing Obamacare. Kimmel came out swinging again this week after Cassidy and fellow Republican Sen. Lindsey Graham proposed a new bill that is set to come before the Senate for a vote next week. On Tuesday night's show, the host panned the Graham-Cassidy plan, calling it "a scam of a bill," adding that Cassidy lied "right to my face." 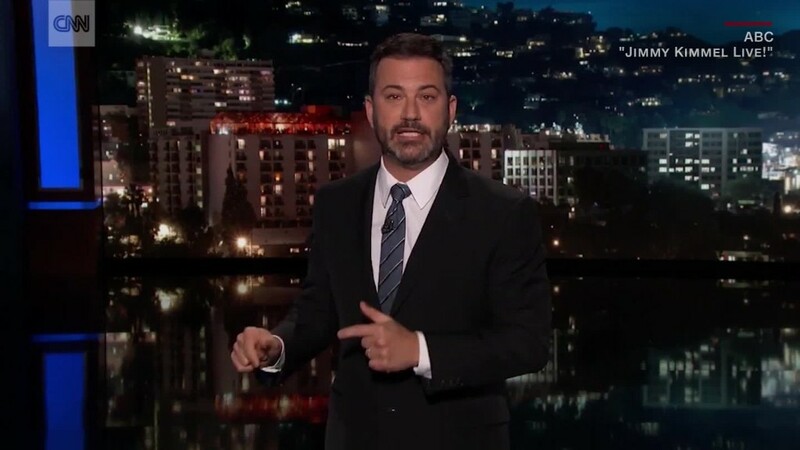 Kimmel's critique inspired intense coverage and analyses, pundits debated Kimmel's expertise on the subject while others told him to stay in his lane, and the comedian found himself again at the center of the health care fight. Some noted that Kimmel upstaged President Trump in the efforts to overhaul health care in the US. "Kimmel has now spent 24 minutes on national TV this week talking about health care," tweeted Dan Diamond of Politico. "About 24 mins more than Trump has." Yet, Kimmel didn't back down. He spoke about Cassidy and health care nearly every night this week and took the complicated subject matter (he compared it to the an "iTunes service agreement") and made it inherently human. "Nothing is as arcane as this health care debate and what Jimmy has done is boil it down to a basic question: Will we be okay if my kid gets sick?" Carter said. "He looked at this bill closely--because one of its sponsors had dragged him into it by saying any bill had to pass the 'Jimmy Kimmel test'-- and he studied it with the zeal any parent would had they a child with a life-threatening condition that needed hugely expensive, life-saving care." Kimmel's battle has also been a family affair. Molly McNearney, the show's co-head writer-- Kimmel's wife and Billy's mother-- also took to social media to make her feelings on the subject heard. We are the lucky ones. You shouldn't have to be "lucky" to be cared for in this country. We're fighting for others. You should too. "We are the lucky ones. You shouldn't have to be 'lucky' to be cared for in this country. We're fighting for others. You should too," McNearney tweeted Thursday. "It would be irresponsible knowing what we know and experiencing what we experienced to 'stay in our lane.' Move over. We're merging."